Most people visiting Guatemala head straight to Antigua upon arrival in the airport. Guatemala City has a bit of a reputation and is often referred to as a sketchy place you could (and should) skip. I am glad I didn’t. 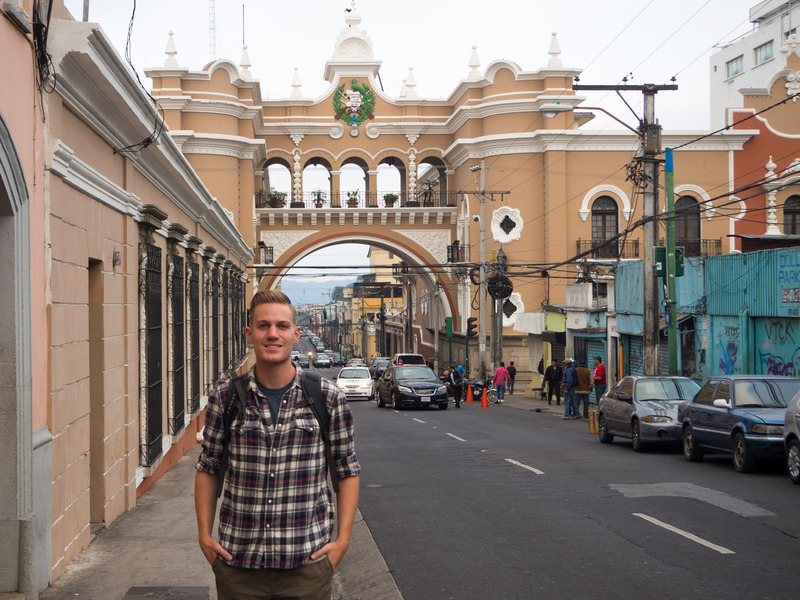 Guatemala City is the largest city in Central America and admittedly isn’t really tourist oriented. Clear tourist infrastructure is lacking, in fact, good infrastructure such as public transportation is lacking in the city overall. But don’t let that withhold you from visiting! While Antigua might look very authentic, the village is quite tourist oriented. Guatemala City, in contrast, gives you a peak into the “real” contemporary Guatemala. Zona 1 is the historical center of Guatemala City. It is a beautiful area to explore on foot. 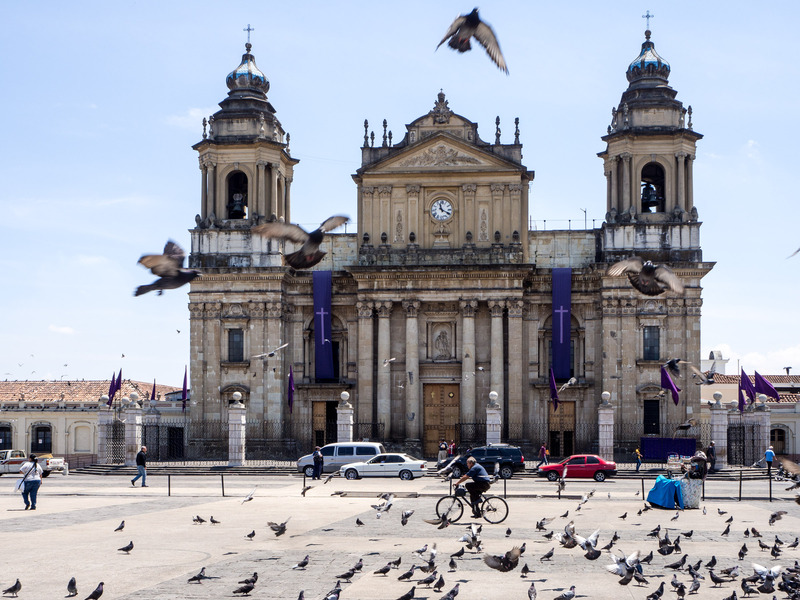 Start on Parque Central, the city’s main square where the Palacio Nacional De La Cultura and the Catedral Metropolitana are located. Stroll your way down on La Sexta (Avenida 6a), a commercial pedestrian street connected to Parque Central. In this area you will find many more ancient buildings, plazas, street markets and churches. Make sure to have a look at the historcal post office’s building; Edificio de Correos. Guatemala City’s art/hipster/rainbow zone. Cuatro Grados Norte is a renovated pedestrian area in Zona 4 full of trendy restaurants, bars and artsy stuff. This place is really cool for (outdoor European terrance/garden style) dinner and drinks. When going out in Guatemala City, you won’t encounter as much tourists as in Antigua or Lake Atitlan. Again, it is way more oriented towards locals. 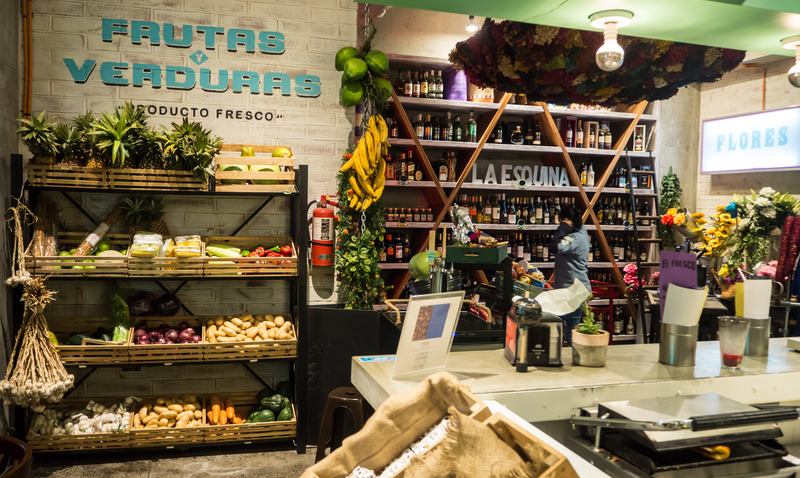 The main areas to go out are Cuarto Grados Norte in Zona 4 and the Zona Viva (Zona 10), while some establishments might be located in Zona 1 or Zona 15 as well; ask the locals what’s on. Either way, don’t go home before having some delicious gringas at LOS TIOS in Zona 15! 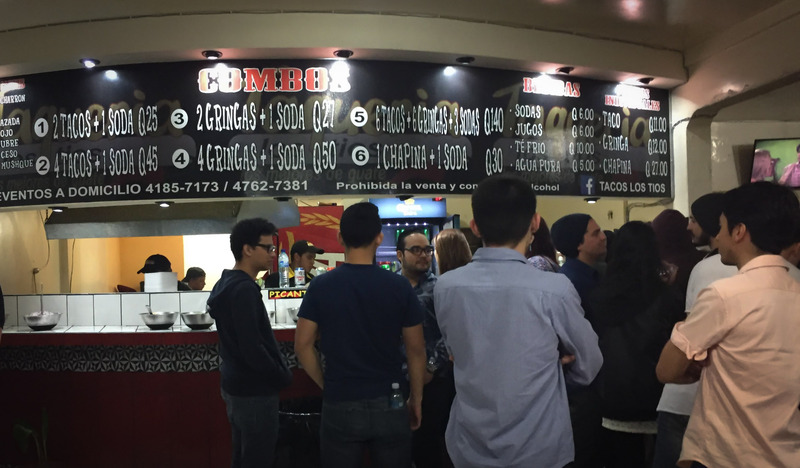 Besides tacos, gringas are the midnight snack in Guatemala City. On my way home in the middle of the night people were all lining up at this restaurant. Gringas are a sort of taco with cheese and “al pastor” meat. Try it. I’m getting hungry as I’m writing this. Everyone is lining up in the middle of the night to get some gringas! Although not a primary reason for going to Guatemala, for those that have been traveling for a while in the region and need to buy certain things, literally everything is available in Guatemala City. From street markets (Zona 1) to high end shopping malls, of which the largest ones are Paseo Cayala (Zona 16) and Oakland Mall (Zona 10). There is also a handcrafts market (Mercado de Artesanias) located close to the airport in Zona 13. Guatemala City also has a dark side. A large part of the residents live in poverty and certain areas are controlled by gangs. 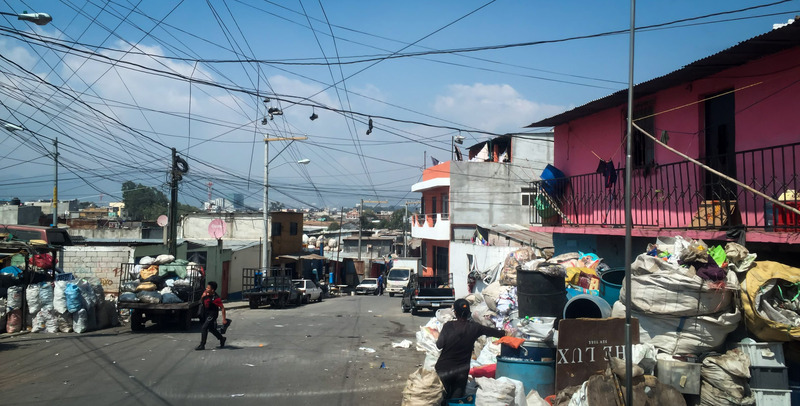 Camino Seguro (Safe Passage) is an organization that helps children that are living around the dumpster in one of the worst areas of Guatemala City: Zona 3. Every week on Thursday an organized tour is available in English for those that are interested in what the organization is doing. The tour, which can also be joined from Antigua, is an eye opener and highly recommended to everyone that wants to know more about this side of the city (and country). Safe Passage also offers various volunteering opportunities and sponsorship programs. Check out their website for more information. Zona 3, where many people live from recycling. The best way to get around in Guatemala City is by taxi or Transmetro. Taxis are best to be called from Taxi Amarillo (Yellow Cab) or Uber, since some of the white cabs are unregistered or stolen. Transmetro is a safe bus system which in many parts of the city has its own bus lane, however coverage is still very limited. “Chicken buses”, the old American school buses are not recommended to use as safety issues have been reported. For those who want to try, chicken buses to Antigua (10 Quetzals) can be flagged in front of the Tikal Futura shopping mall in Zona 7 (opposite of the mall on the main road). Major (inter city) bus companies usually have terminals located in Zona 1. Tip: Uber can also be used to go to Antigua, it should cost less than 200 Quetzals. Most budget hotels are located in Zona 1, although I personally would opt to stay somewhere else as this area gets a bit sketchy at night. I booked an Airbnb in Zona 13 conveniently located opposite of a Transmetro stop. Other good areas to stay are Zona 10, 14 and 15.